Autumn is a time of harvest and gardeners the world over show off their produce, livestock and hand-made items in county fairs, harvest festivals, agricultural shows, fetes and exhibitions. We enjoy gathering together to celebrate the year's bounty. As early as the 1200s, merchants from all over Europe, Scandinavia and the Byzantine Empire traded and sold their goods at the 45-day "Scarborough Faire," a forerunner to the modern-day county fair. Many of the traditions remain the same: farmers, artisans and homemakers select the best they have raised, grown, preserved or crafted, and friendly competitions determine who has been the most successful in each category. Local fairs have been a part of rural culture for many generations and western Kentucky was no different. My grandmother, who made it a point to preserve something special for the fair each year, canned corn on the cob. In the 1930s, she and her friends, Betty Rudolph and Miss Effie Rudolph, had an annual competition among themselves to see which one could win the most ribbons at the local Sharpe School fair. 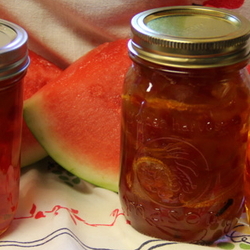 My grandmother's skills were legendary: her jelly looked like stained glass and rows of canned beans, tomatoes, and other fruits and vegetables lined her pantry shelves each autumn and her quilts were works of art. In those days, there was very little in the way of entertainment available to west Kentucky farmwomen. Aside from weekly church services or an occasional quilting bee, the annual fair was about their only social gathering. My grandmother and Betty raised huge families and were responsible for feeding them throughout the year with the produce they preserved. Miss Effie never married, but she was a talented cook and respected by all of her peers. She loved the fair and always entered numerous items in the cooked and preserved food categories. Her good planning, creativity and attention to detail usually resulted in many ribbons each year. In 1937, my grandmother wanted to make sure that she entered something so special that Miss Effie would never think of duplicating it. Canned corn was popular, but typically, the kernels were cut from the cobs before preserving, so she decided to can corn that was still on the cob. One thing all fairs have in common is that participants strive to exhibit the best they have in a manner that will gain favor with the judges. My grandmother was no exception and for her entry she selected blemish-free ears of corn that were uniform in size and appearance. They were packed and processed in her nicest jar. The result was lovely whole ears of corn, standing at attention in her container. She carefully packed this jar and her other canned goods in a box surrounded with straw. The local fair was held at the Sharpe School. Students displayed projects from class and the adults brought the best of their livestock and harvest. Quilts, loaves of bread, pies and canned goods were the ladies' areas and my grandmother was pretty confident she'd take home ribbons in the majority of these categories. She knew that Betty would enter a fabulous quilt and Miss Effie would have pies, cakes, jellies and canned vegetables prepared in her nicest containers. The family piled in the wagon along with the other exhibits and the jar of canned corn, and headed for the school, which was located two miles away. The mule that pulled the wagon knew the way, because he was also the informal school bus for the neighborhood kids. Each morning, he pulled a wagon full of children to the school, then driverless, followed the road back home. In the afternoon, the trusty mule and wagon were dispatched without a driver to collect the neighborhood children. Mules are dependable and intelligent, and this one was a treasure. Even in today's world, they are popular in this area and mule competitions are a part of many fairs and agricultural shows. We don't know much about the winners at the 1937 Sharpe School Fair, or who ended up with the most ribbons. However, the jar of canned corn on the cob won first place. We know this because my grandmother glued a note to it stating "First Place, won by Ella Hancock, 1937. DO NOT THROW AWAY." She placed the jar of corn prominently on her pantry shelf and everyone knew not to touch it. The corn moved with her in 1960 to a new home. My grandmother passed away in 1967--thirty years after the fair. Sometime after her death, the jar was finally discarded. Fairs and harvest festivals have evolved over the years. Good roads and modern transportation make it easy for participants to travel great distances. We have state fairs, regional and county fairs. The image above was from the Mid-South fair in Memphis, Tennessee in the early 1960s. 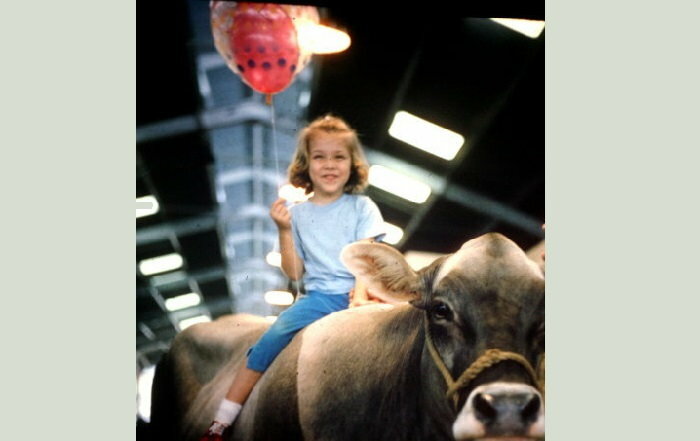 Our neighbor was showing his Brown Swiss milk cows and my dad snapped my picture astride one. There are livestock divisions for all farm animals and many evenings are capped with a showcase featuring working or performing animals. A popular event throughout the South is the Saddle Mule competition. These mules are versatile as horses, and classes ranging from Western Pleasure to formal Dressage draw a huge number of participants each year. The mule image in this article is one of Phillip and Sharon Thompson's champion mules. Sharon is Betty Rudolph's granddaughter. She and her husband carry on her grandmother's legacy of friendly competition with their World Champion gaited saddle mules, Ace, Baby Doll and Sonny Boy. They compete throughout the region in local and national events and their mules are among the best in the world, winning numerous honors. In modern society, the internet has closed distances between towns, cities, countries and continents. We are a global community with no boundaries and members from all parts of the world interact daily with no concern about the physical distance between them. It was a big deal to travel a few miles in my grandmother's day. She and her friends only lived a short distance from each other, but getting together involved an all-day trip. These days, we have the ability to chat with virtual neighbors across a garden fence that might be an ocean. This year, Dave's Garden is continuing on this centuries-old tradition, as we open our 8th installment of the county fair. Members are invited to share their images in this friendly competition. We'll even hand out virtual blue ribbons to the winners. Gather with us for the Dave's Garden Pixel County Fair, A Celebration of Harvest Traditions with a Virtual Twist. You can vie for a blue ribbon of your own, to be displayed on your member page, or simply weigh in with your votes for the best in each category. Winner's receive a virtual blue ribbon and a coffee mug with a blue ribbon along with a 1 year subscription to the premium forums. 2nd and 3rd place runners-up receive 2 month and 6 month subscriptions. Here is the link to enter the 2018 Pixel County Fair. A special thanks to Phillip and Sharon Thompson, and their World Champion mules, Ace (Kentucky State Champion 3 years,) Baby Doll (Kentucky State Champion and World Champion,) and Sonny Boy (Champion, Cantering Class, World Show.) They graciously allowed me to take the mule image in this story. 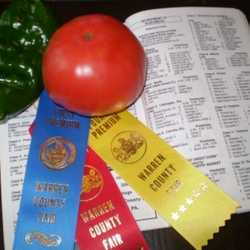 The 2017 DG County Fair Is Now Open For Entries Vegetables at the Fair Celebrate! 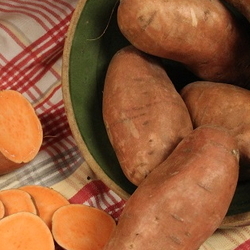 It's Tater Day!